Portsmouth, the famed home of Britain's Royal Navy, is pumping up its tourism as it watches Britain's military shrink. 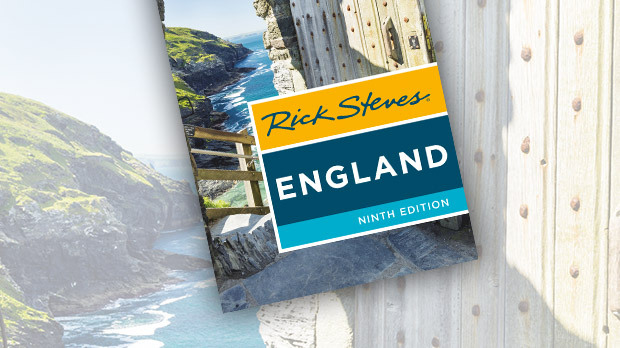 The city is a major port on England's south coast, and busy with ferries heading for France's Brittany — and the many travelers who pass through have plenty of excuses to stop here. Portsmouth has done a fantastic job putting its amazing maritime history on display, and comes with enough candy-floss-on-the-beach fun to save you a visit to more touristy seaside towns like Brighton or Blackpool. 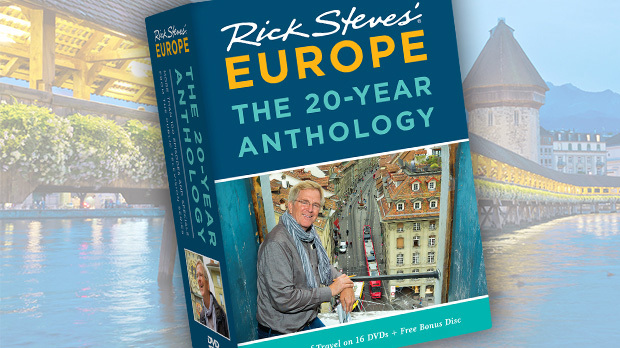 In London, I passed a billboard advertising an exotic harbor skyline with the question: "Dreaming of Dubai?" Then the billboard's tagline breaks it to me: It's a photo of Portsmouth, 90 minutes away by train. Comparing Dubai and Portsmouth is a stretch, but Portsmouth's iconic Spinnaker Tower is a sail-shaped monolith reminiscent of a Dubai skyscraper. It stands like an exclamation mark above a once run-down military port that is morphing into a pleasant people zone as the city undergoes an impressive gentrification. Like Seattle's vaguely futuristic Space Needle, the 560-foot-tall Spinnaker Tower has become an icon of its city. In 2015, the Dubai-based Emirates airline paid 3.5 million pounds to change the Spinnaker's name to the "Emirates Spinnaker Tower" — but I just can't get comfortable calling it that. Visitors can ride up the tower for a panoramic view, or court acrophobia with a stroll across a glass floor. Portsmouth works well as a day trip from London. Almost all of its visit-worthy sights line up along a two-mile stretch of waterfront, from the Historic Dockyard in the north to the Southsea neighborhood, with the city's D-Day Museum, in the south. The top sights in the walkable core can be seen in a few hours. But with its bustling shopping complex and Spinnaker Tower at Gunwharf Quays, the D-Day Museum, and seafaring atmosphere, you can easily fill a whole day. The highlight of Portsmouth is its Historic Dockyard, home to Britain's great warships, dubbed the "Wooden Walls of England." 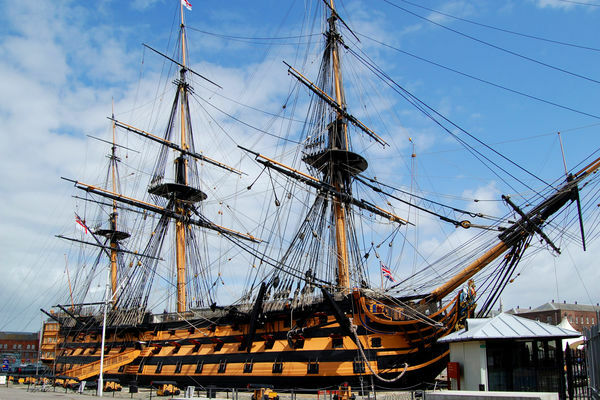 Here, visitors can marvel at both the modern-day warships anchored on the docks and visit several historical warships, as well as an entertaining collection of model ships, paintings, uniforms, and other artifacts at the National Museum of the Royal Navy. Britannia's HMS Warrior was the first iron-hulled warship — a huge technological advance in the late 1800s. The Warrior's very existence was sufficient to keep the peace, so it never saw combat and is still in ship shape today. Perhaps the most consequential battle in British naval history was the Battle of Trafalgar, where Admiral Nelson and the British fleet defeated Napoleon's fleet, and thereby saved England from so many uninvited French guests back in 1805. Nelson's flagship, the majestic HMS Victory, is the main attraction here, and for Brits, a visit here is a patriotic pilgrimage. Henry VIII's much older warship, the Mary Rose, is less well-preserved but just as interesting. In 1545, it capsized just two miles offshore on its way to engage a French enemy fleet. Of the 400 sailors onboard, only about 30 survived. The wreckage — with all sorts of Tudor-era items — was raised from the mud in 1982, and today it is beautifully displayed in the newly renovated Mary Rose Museum. As a major military target, Portsmouth was flattened by WWII bombs (ironically, the Historic Dockyard was relatively unscathed). Postwar reconstruction was hasty and poorly planned, and the city became infamous for its bad architecture. But that's changed. Besides the waterfront shopping complex and Spinnaker Tower, efforts to rejuvenate have included refurbishing the old historic district. From the Old Portsmouth promenade, you can watch a procession of 21st-century ferries as they navigate into and out of port. It's an enjoyable place to stroll around and imagine how different this district was in centuries past, when it was filled with salty fishermen and sailors who told tall tales and sang sea shanties in the once rough-and-tumble and now trendy pubs. While exploring Old Portsmouth, look for the stylized chain-link pattern in the sidewalk, marking the Millennium Promenade. The chain symbol recalls the great steel chain that once spanned the mouth of the harbor and was raised to block invading warships. For a pleasant stroll, I like to follow the portion of the trail south of Old Portsmouth along the oceanfront. Interpretive panels along the way give insight into Portsmouth's fascinating evolution, from its stone towers and fortifications to Clarence Pier, a Coney Island-type beach-party zone. While many areas of Portsmouth are becoming gentrified, deep down it's still a hardworking port town with plenty of touristic value. 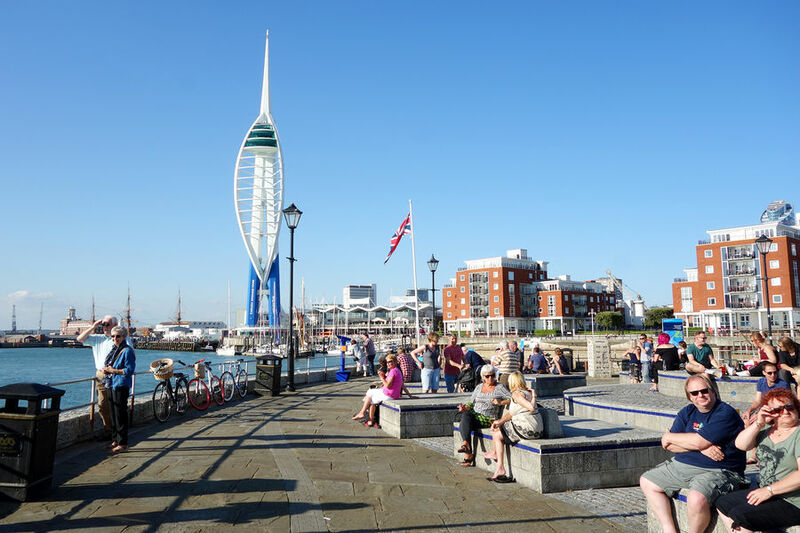 The blustery beaches may not be as warm and sandy as Dubai's, but the city's fascinating military presence and modern attractions make Portsmouth a fun and educational stop on a trip to southern England.